Outstanding blue-green foliage with horizontal tiers of branches. The form is low, spreading, and mounding. 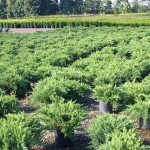 It prefers full sun and a well-drained soil, and is tolerant of poor and alkaline soils. 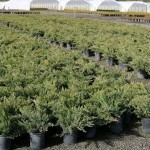 It is drought tolerant once established. Useful as a ground cover, mass plantings, or on banks.